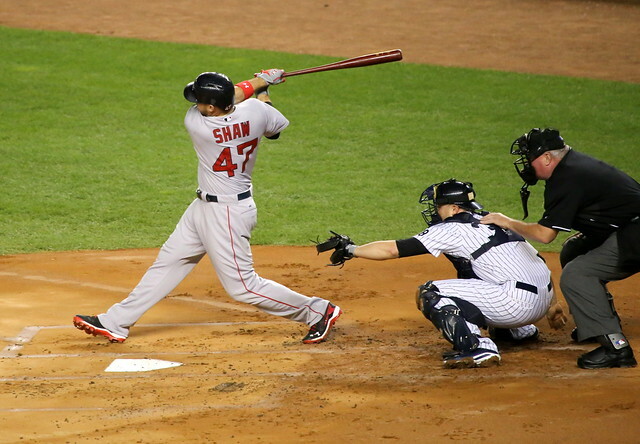 Travis Shaw of the Boston Red Sox made quite an impact towards the end of the 2015 MLB Season. With a solid .813 OPS (On-Base Percentage Plus Slugging) and 13 home runs in only 65 games, it seemed clear that Shaw belonged in the Major Leagues. The son of former Major League relief pitcher, Jeff Shaw, "The Mayor of Ding Dong City," is off to a hot start in 2016, hitting .342 with a .984 OPS in his first 44 plate appearances of the season. One of the major story lines of the 2016 Spring Training preseason for the Red Sox was the continued under-performance of incumbent third baseman Pablo Sandoval. As it turns out, the reason for Sandoval's poor performance could well be the after-effects of an injury recently discovered, as reported by Fox Sports. This could mean that the former San Francisco Giant All-Star could be out for quite some time. This is good news for Shaw, who is living up to his starting position at third base, while spelling at first base for Hanley Ramirez on occasion. While Travis Shaw began his MLB career as a first baseman, he's been flashing the leather at third base to begin 2016. According to Shaw's player page on FanGraphs, he played league-average defense at first base in 2015, but has already 3 Defensive Runs Saved (DRS) at third in only 78 innings played at the position! He also has credit for 1 Defensive Run Saved at first base. Clearly, his defense is an asset. This is in stark contrast to the-11 Defensive Runs saved that Pablo Sandoval recorded in 123 games for 2015. Clearly, Travis Shaw has earned a place in the Major Leagues with the Red Sox. Some very difficult decisions will have to be made when Pablo Sandoval is ready to return to play, as Shaw clearly appears to be the better ballplayer at this point.